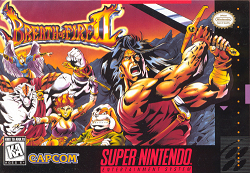 In this review, we play the SNES RPG game Breath of Fire II. We find out if this sequel is worth playing again. Breath of Fire II was released in 1994 and would be the sequel to the original Breath of Fire game released on the same console earlier in the same year. While the game does feature the same main character (Ryu) as well as a character or two from the previous game, the characters and plot are largely new and separate from the previous game. That doesn’t mean this game is nothing like the original. Instead, there are numerous references to the previous game including cameo appearances from numerous playable characters from the previous game. The references from the previous game really helped give this game a sort of life of its own. The plot follows Ryu, the destined child of the dragon clan. The game begins with a flashback to when Ryu was a child. It then skips forward a bit when he initially meets Bow. They both eventually wind up in a cave, meeting a monstrous demon. The main game ultimately begins when Bow and Ryu seek work as rangers in Hometown. They are given a job of finding a lost pig. While Bow is reluctant to take the task on, he finds out that the person requesting the return of the pig to be a young woman from Windia. Bow immediately changes his mind and volunteers to take on the seemingly menial task. What ensues are the critical steps leading to the main quest of seeking the ultimate demon that seeks to destroy all life on earth as well as the mysterious connection of St. Eva in all of this. Along the way, Ryu recruits numerous characters including Rand, Katt, Nina, Sten, and Spar. Different characters have their strengths and weaknesses. Eventually, you have to shuffle your part of four between the numerous characters. This is because while your current party of four are obtaining experience and equipment, the remaining characters are resting at Township – your base camp for a vast majority of the game. The only time characters gain any experience while resting in Township is Bow who does gain a few levels while you prove his innocence. It’s nothing huge, though. I found this to be a bit more of a hassle than anything else. You can’t let various characters languish in Township because in order to move the plot along, most of your characters have to be up to snuff at that particular point in the game that they are needed. The constant micro-management of both leveling up each character (which can at least be seen at most dragon shrines), and ensuring they have the most up to date equipment can be a pain at times. This is also a major difference between this game and the prequel. Previously, you could just swap out active characters with the inactive ones whenever you liked (for the most part). This game forces you to physically go somewhere for the purpose of swapping out characters instead. As with the previous game, you can obtain a number of different items along the way to help with your quest. Herbs can restore a small portion of HP (unless you are at the beginning, in which case, it basically restores all of your HP because your maximum would be so low). WFruit can restore a small portion of your AP at the expense of 20HP. Antidot items cure poison status. Lifepil items recover fallen comrades. These are some of the items you’ll encounter along the way. Some of these items can be bought while others can be found in treasure chests you encounter along the way. Also along the way are various weapons and armor upgrades. There are main weapons that are usually tailored to a particular character. For instance, a SW (Sword) weapon can usually be equipped by Ryu and sometimes Jean. Meanwhile, a KN (Knuckle) weapon can only be equipped by Rand. An ST (Stick) weapon can only be equipped by Katt. While more than one character can equip certain weapons, these tend to be rare compared to the large variety of weapons that can only be used by a single character. Armor can include RB (Robes) and warrior AR (Armor). The characters that can equip these items depends on the armor, but multiple characters having access to these items are a bit more common. There are also pieces of armor for your head and armor for your arms. In addition, there are two “etc.” item slots to equip things like RG (rings) items. Some items grant you immunity to certain status afflictions while others can grant a boost in certain stats (i.e. offense or defense). If you’ve played the prequel, you’ll know this didn’t play much of a role in that game, but in this game, the role is a bit more stronger which was very nice to see given I thought it was underutilized previously. What is also found in this game is the concept of fusing characters. In the previous game, you were able to fuse different characters to form a sort of super character. This has been done away with in this game. Instead of fusing multiple characters, you fuse your characters with various shamans. You can fuse a character with up to two shamans. Sometimes the results are less than impressive. Other times, your character will morph into an entirely different look with virtually every stat raised. Sometimes, the fusions just don’t work at all. In the case of Ryu, fusion can never happen thanks to his dragon powers. One nice feature found in this game is the dragon meter. You can affect your overall happiness and the happiness of others based on the decisions you make. Deep purple is the worse mood while flashing multiple colors is the best possible mood. This meter is found both in the status screen as well as occasionally in the top right corner of dialogue boxes. While this feature doesn’t affect much with most characters, it can impact on what you obtain in very specific situations. It’s a nice little feature that does spruce things up nicely. As you level up your character, your stats will increase. This includes maximum HP and AP, offense, defense, strength, agility, and wisdom. Naturally, the higher the stats, the better your characters will perform in battle. While weapons and armor can impact your overall offense and defense (typically speaking, but there are exceptions), you can also find stat raising items that can boost individual stats. For instance, a Pwrfood item will increase a characters strength by 1 point. The impact is an increase in offense by 1 point. In this game, you can use all the help you can get. The main currency of this game is coin. Especially in the beginning, coins are in short supply and are most often obtained through the many random encounter battles you face both in the main outdoor map as well as dungeons. Sometimes, you can obtain coins through the various treasure chests you encounter, but a vast majority will be obtained through battling enemies. Selling outdated equipment does help as it helps keep your inventory clean and give you a small boost in coins, but the coins you get are typically a small boost at best in the overall picture. One thing you’ll use quite frequently are vendors. There are item shops that sell general supplies. Often, there are banks next to these item stores which can be used to store items and coins. By the end of the game, you will likely rely on banks to store items as you find your free spaces in your inventory running low. Other shops are armory shops which sell weapons and armor. There is also the inns where you can rest and heal your characters. A few of these inns are free, but others will cost money (ranging around 10 – 50 coins depending on where you sleep). Finally, there are a few specialty shops that can sell things like battle only items, fish, and other miscellaneous items. They don’t appear that often, but it is possible to find and use them. In addition to all of this are dragon shrines and churches. In both places, you can save your game and, later in the game, swap out party members. As you work your way through the game, you’ll encounter various forms of transportation. These include boats and birds. Some of these modes of transportation are utilized through activating a characters special ability. Jean, for instance, can turn into a giant frog and both hop around and swim through various lakes. Spar can walk through forests. Sten can reach out and grab steaks for the purpose of traversing small gaps in the land. Other special abilities include Rand’s ability to roll around in a ball. Katt has the ability to break things with her stick. Bow can hunt with his crossbow. Ryu can, with the aid of a fishing rod and bait, go fishing at various fishing spots. One thing I like about this game was the introduction of the clean feature. Thanks to this feature, various items can be “cleaned” for the purpose of organization and reduction of used spaces. For instance, if you have a “Herb x2”, “Herb x1”, and a “Herb x5”, using the clean feature will combine these into one slot as “Herb x8”. This example will also free up 2 spaces for other items. The maximum number of the same item that can be combined is 9. Another thing to note is that the ability to combine items is generally limited to the more highly available perishable items and not for things like weapons, armor, and numerous combat-only items. If you aren’t completely satisfied with the order of the items, you can also use the “Order” feature which allows you to move various items in your inventory. Just know that “clean” will undo your work if you use it after, so beware. Another interesting feature is the party ordering options. Not only can you change up the order of your party, but you can also change up how they appear in battle sequences. This can offer an entirely new avenue for strategy. I admittedly didn’t really take advantage of the feature while I played, but it is there. One excellent feature is the ability to use a map. While the map feature may be borderline useless towards the beginning, by the end, you’ll find it almost essential while navigating the world of Breath of Fire II thanks to the various forms of transportation made available to you by the end. While the map may be a bit crude, it’s still leaps and bounds better than nothing. One thing I wasn’t a huge fan of in this game was the occasional plot points that leave you with absolutely no clue as to where to go next. It doesn’t happen that often as you usually have a clue as to where to go next, but sometimes you are just left to your own devices. One example of this is when you gain the bird flying ability. You find yourself outside of Windia and probably asking, “OK… now what?” This occasional gap in the plot makes it almost essential to having a walkthrough nearby for the occasional prodding. A great thing about this game is the overall improvement in the fishing minigame. Fishing was an element found in the previous game, but it was largely you walking up to an area, using the special ability and getting a message of either success or failure. Not much of a minigame in the end. In this game, it is a full blown real minigame. You cast your bait, attract a fish (or hook it onto a random treasure chest if your lucky!) and pull it up with your rod. The strength of what you caught depends on, well, what you managed to snag with your line. If you let the line get away or catch something with the line, you will lose your bait. Once you caught something, you have to real it in with your button mashing skills. The power you have in your rod depends on what you have equipped. A standard stick won’t hold up to much, but the CharmRD will allow you to catch almost anything. If you catch a fish, you can also tire it out, making it easier to reel it in. I thought this minigame feature was a massive improvement and definitely welcome. ONe thing I found puzzling was the insistence of naming items with shorthand. This was a pain in the previous game and it just doesn’t get a whole lot better in this game. It sometimes takes a bit to figure out what some items even are. Ultimately, it hurts the overall polish of the game and I don’t see why the need for abbreviations in various item names. Another great element in this game is the huge variety of things you encounter. The puzzles are almost never the same and you’ll always encounter something new right up to the very end of the game. I thought this showed great skill in overall planning in this game. So, a very well done element in this game. With everything mentioned so far, I would have likely given this game a mid to high 80% overall. Unfortunately, there is one big pitfall to this game. Grinding. I do like to grind from time to time in my RPG games just to satisfy my curiosity of how high I can push those stat and level numbers. Unfortunately, in this game, this is eventually a mandatory exercise. At the beginning, grinding is done to be able to afford some of the best equipment at the time. Towards the middle and end of the game, grinding allows you to survive different areas you are about to explore. Towards the end of the game, I found myself at roughly level 39 for Ryu. While it’s great for many areas of this game, going down into the final dungeon at this level is borderline suicide – especially if your other characters in your final party are nowhere near where Ryu is. To get a good picture of how bad grinding can be, you could find late game battles netting you a solid 6000-13000 experience points each. Sounds impressive until you realize the experience points you earn is divided four ways amongst your characters in your party. To add insult to injury, by the time you are reaching the mid to late 40s in levelling for Ryu, you’ll likely see your experience points exceed 1.5 million. As I’ve said in previous RPG reviews, it’s one thing to grind for the fun of it, but quite another just to survive the next area. Given how long battles last, the grinding drags on and on sometimes. It makes the game boring at times. You might not encounter much midway through the game, but in the beginning, it’s a bit painful. At the end of the game, you get grinding in spades where you could spend whole days at the task. I thought this was a balancing issue in this game more than anything else as the requirement is a bit excessive in my books. Generally speaking, this is a very solid game. Has interesting features and offers a few twists over the previous game. The only major downpoints were abbreviated item names, the occasional plot gap, and the grinding. Graphically, this game was quite a treat for a 2D game. The various enemies throughout the game are quite varied. This game simply doesn’t suffer from the retexturing problems like the previous game. There are retextured enemies, but they are few and far between compared to the overall number of enemies found in the game. The transition from day and night was great to see. The small bits of animation in the battle sequences were great. My only problem is that some of the more powerful spells take a bit too long to play out. Freeze spell, for instance, can be a real thumb twiddler. The length of these animations are nowhere near the disaster found in Final Fantasy 7 for the most part, but a few of the attacks start getting close to it. The shaman feature also gave a certain shine to the game in this area because the sprites morph completely, though fused characters sometimes have status ailments that wasn’t the games finest hour (i.e. Rand in his rodent form doesn’t change much when he is hit with a sleep status ailment in battle). On the flip side, the normal versions of the characters were nicely represented. The variety you can find in the environments as you explore was a real treat. So, a very solid effort on this front. The audio was quite impressive in the implementation side of things. The change in battle music as well as overworld music as you progress through the game was a very nice element. Some tracks like the one on one fights was excellent. Other tracks were nicely done and really aided the mood of the overall game. While it wasn’t the greatest score I’ve ever heard from a SNES game, the implementation and variety overall really helped put it over the top for me. The sound effects were also very nicely done. Overall, this was a very solid game. The plot was interesting. The references to the previous game was a nice touch. The dragon tear feature to see different moods of various characters was a great side-feature. Some of the inventory features was a great upgrade. The fishing minigame was also a very impressive improvement as well. The variety of characters and the ability to fuse them with shamans was interesting. The constant changing of modes of transportation was nicely done and the characters special abilities, strengths, and weaknesses were interesting. The strategies you can form with the order feature was nicely done. The etc. equipment was better utilized this time around. The pitfalls were the occasional plot gap that forced you to grab a guide to figure out what the heck you needed to do next. Most fatally was the grinding that really sapped the enjoyment from time to time. The graphics were nicely done and the audio was expertly implemented and nicely done overall. So, overall, I definitely recommend this game even if you probably will never complete it thanks to the required grinding. Furthest point in game: Beat the game, netting what was apparently the best possible ending.